SynaMan makes file sharing anywhere at anytime simple. But if you think SynaMan, is just a remote file manager, you’re mistaken. Thanks to our developers, SynaMan has so much to offer. Looking beyond ordinary file sharing tools, SynaMan is packed with advanced business rules and functions keeping your data secure with a 100% privacy guarantee, no limit on how much you share, or whom you can share with, interface customization, and much more. So, whether you are using SynaMan for personal or commercial use, you’ll want to take full advantage of our recommended list of top features. One of SynaMans greatest design benefits is, it is a web-based utility. SynaMan operates completely through a web-based interface requiring no other software for installation or setup. Users can always stay connected to the interface via a web browser using any internet accessible device. Since SynaMan is strictly accessible through web browsers, the intuitive web interface allows users and admins to access, move, copy, download and upload files as if you are working locally from virtually anywhere at anytime pending internet and web access. Many competing solutions require their users to upload files to their server. These uploaded files are then downloaded by the intended user. But, this never happens when you use SynaMan. Files on your machine are never uploaded to a third-party server and there is no middle man to intercept your data. The transferred files stay on the host machine and can only be accessed by authorized users. SynaMan allows for an added means of security through a Secure Sockets Layer. The Secure Sockets Layer, commonly known as SSL, is an industry standard encryption link mechanism that allows for a more secure file transfer process. The link ensures data transferred through the web remains private. When SSL is enabled, the URL of your browser will start with HTTPS, the S which of course stands for secure. Administrators have the ability to backtrack all SynaMan user activity through audit trail logging. Admins can track when users log in and can view the contents in a folder, and can view the contents of uploaded or downloaded files. 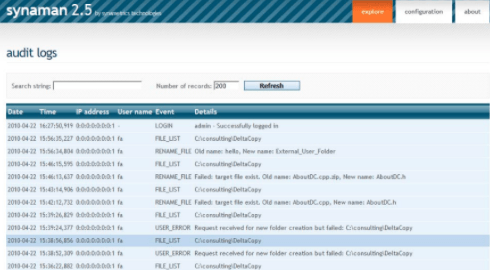 In each of these scenarios, log files are generated and can be viewed by the admin. Incorrect password attempts: The Admin will receive a notification if someone tries to log in with an incorrect password attempts of more than 3 times. Block IP Address: The Admin will receive a notification when someone tries to connect to SynaMan unsuccessfully from a specific IP Address for more than 5 times. Tricky Path: The Admin will receive a notification when someone specifies a tricky path manually. Write to Read Only: The Admin will receive a notification when someone tries to write in a shared folder for which he has only read access. Download from write-only: The Admin will receive a notification when someone tries to download files from a shared folder for which he has only access to upload files. Unlike ordinary filer managing programs that put a limit to the size and type of file you wish to share, SynaMan puts no limits on file sharing. 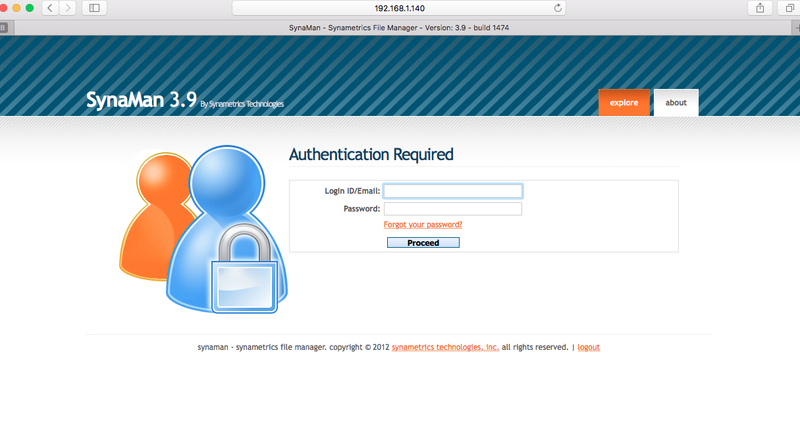 SynaMan allows for unlimited file sharing through an embedded SMTP Server. Emails are designed to hop from one SMTP server to another before reaching their intended destination. Servers supporting even the smallest email size dictates the maximum size of an email. Consider the image below. John uses a popular email client like MS Outlook or Mozilla Thunderbird, which is configured to use SynaMan as the SMTP server for out-bound emails. SynaMan's embedded SMTP server receives this message. If the attached files are larger than a pre-defined size, SynaMan removes the attachment from the email and forwards the email body to the next SMTP server. It saves the attachments to the host machine where SynaMan is running and creates a public link for it. Mary gets John's message without any attachments but containing an HTML link that she clicks to download the 25 MB file John intended to send her. In a typical file sharing environment, user accounts are created for anyone who wish to manage their files. Consider a scenario where a business associate or a client needs to send you a large file, but they are not a SynaMan user. Because this is a one-time need, it would be unnecessary to create an account for this person. SynaMan allows you to upload and download files from these one-time users by creating public links. These public links are HTML hyperlinks sent via email to the desired user. This user can click the hyperlink from their email to either upload or download file through their web browser. By integrating an active directory, Administrators can eliminate two major problems. The first is user synchronization. If a user exists on your Windows network, it gets automatically added in SynaMan. Additionally, every user that is created automatically can be assigned a home folder allowing them to upload and download files without any manual work. The second is password synchronization. Passwords are synchronized It is common for users to change their passwords periodically. Since users are tied with your Windows domain, SynaMan will always query Active Directory to authenticate users. This eliminates the need for administrators to modify passwords. With total branding, administrators can modify the looks of SynaMan to match the theme of their corporate website. Admins can upload custom images with their company logo and cascading style sheets and publicly accessible pages can be fully customized. Total branding also allows for seamless navigation between your corporate website and SynaMan's web interface. Download and upload multiple files at once. Complete partial transfers. It is common to lose network connectivity when transferring large files. The enhanced browser can start where the last transfer failed. Quick edit is a feature allowing users to quickly modify the contents of a file on the remote machine and SynaMan will automatically upload your changes to the remote machine. Besides using a browser, the Enterprise edition of SynaMan offers a command line version allowing users to upload and download files using scripts. The command Line Interface (CLI) supports both uploading and downloading files with wildcards.